Manufacturer of sarees, hand looms, salwar and kurtis. Swayamsampurna was founded to place equal priority on promoting women’s financial and social rights in 2008, and was registered as a Mutual Benefit Trust in 2010. Owned and managed by underprivileged rural women living across 55 villages in the district of 24 Parganas (South) in West Bengal, this unique financial institution has a 15 member Board of Trustees and a 52 member General Body comprising community women. With the belief that access to financial resources is one of the key pillars to women empowerment, the traditional crafts based income generation programme began in 1990. It began to work primarily with Kantha - the traditional embroidery form of this area. It then expanded its range to manufacture soft toys and accessories. In 2006, garments were also added to the list of products. 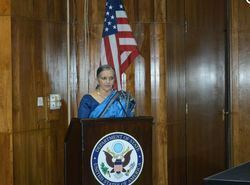 Jeevika’s intervention in Sustainable Agriculture began in 2008 when we heard about the System of Rice Intensification. Since our area has a large acreage under paddy production and over 40% of the families of the 10,000 women organized through us into the independent microcredit federation “Swayamsampurna” are involved with agriculture, it made sense for us to take up this activity. Also, in the heavily patriarchal world of agriculture, we insisted on the involvement of women farmers and employed women as trainers. Implements supplied through our intervention are looked after by community farm implement committees with 50% women members. And over 50% farmers registered with us in each season are women farmers. Over the past years the programme has covered around 1200 farmers, and has indirectly influenced around twice that number. The average yield of paddy was and continues to be 3.6 tons per hectare; with SRI we have been able to increase this to 5.4 tons per hectare at slightly lower total cost of production. Right from the time when Jeevika began to work in the community, it has observed that lack of opportunities of girls and women, violation of rights in general and violence against women and girls are the prime issues which affect the lives of women and young girls in the operational area. Jeevika felt it necessary to adopt a two-pronged approach – one being preventive and the other being rehabilitative - to combat the crisis which is affecting the lives of the young girls in its operational area. The interventions are meant to place equal priority on addressing immediate needs as well as designing long term approaches that will serve as preventive measures. 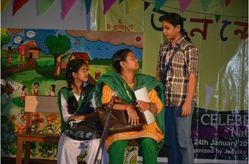 Jeevika organizes round the year campaign programs against Violence Against Women (VAW) through rallies, theatre performances, seminars and workshops. 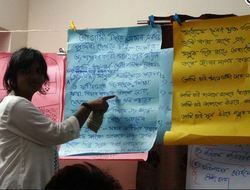 Alor Disha, an independent forum deailng with legal cases on all forms of VAW, was born out of Jeevika’s women’s self-help groups. eevika runs a host of income generation programs (IGP) including training and production units for soft toys & embroidery and tailoring and courses in basic & advanced computer skills. Jeevika’s micro savings and credit program which began in 1990 with women from 3 villages today involves nearly 5000 women from 37 villages. 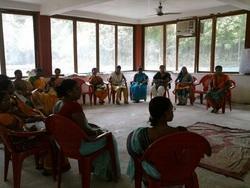 It has achieved its goal of forming an independent community-run federation, Swayamsampurna, in 2008. The community Jeevika works with includes a large population of farmers. 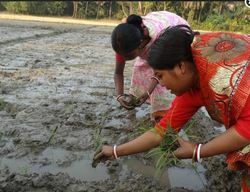 In 2008 Jeevika conducted a community survey to assess interest and need for System of Rice Intensification (SRI) a sustainable rice cultivation method that increases yield and promotes sustainable farming practices. The SRI program for the year 2010-11 involved nearly 500 farmers. 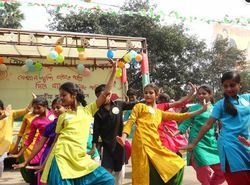 Jeevika’s SRI initiative is also involved with the state-wide network called BANGLAR SRI which aims to promote SRI on the field and the state policy level. Jeevika runs a host of income generation programs (IGP) including training and production units for soft toys & embroidery and tailoring and courses in basic & advanced computer skills.